The pair went head to head in Cardiff in what was billed as the first big debate ahead of the referendum on whether Britain stays in the EU. Ukip leader Mr Farage said the UK would be better off leaving, but Welsh Labour leader Mr Jones said that access to the European market had massive benefits not just for Wales but the UK as a whole. They also disagreed strongly on the issue of immigration. Prime Minister David Cameron has hinted that an in-out referendum could take place as early as this summer. 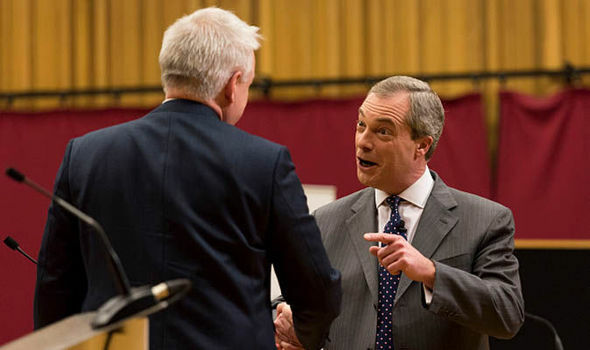 Mr Farage and Mr Jones were at loggerheads during the hour-long debate in the Welsh capital on Monday. Hosted by the Institute of Welsh Affairs and chaired by broadcaster Adrian Masters, each opened with a three-minute speech before fielding questions on three different topics. Mr Farage said that Brussels meddling had turned the UK into “a subordinate member of a bigger club”. He added: “I believe we will be better off out. We should make our trade deals and stand on our own on the world stage and re-engage with the Commonwealth and others. Barrister-turned-politician Mr Jones countered that 200,000 jobs in Wales relied on European trade.